On July 17, 1918, Bolshevik authorities, led by Yakov Yurovsky, shot Nicholas II and his immediate family in the cellar of the Ipatiev House in Ekaterinburg, Russia. Since then rumors have circulated that one of the Romanovs, Grand Duchess Anastasia, had miraculously survived assassination. 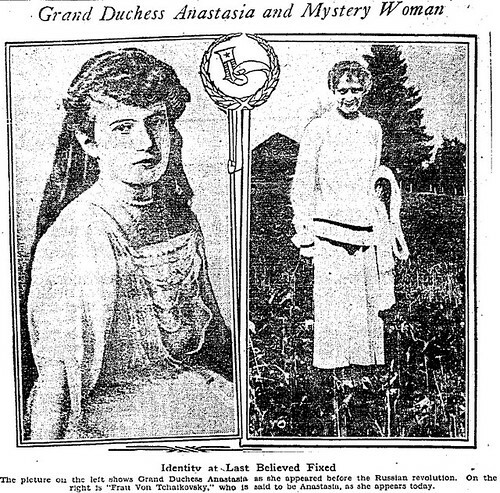 The woman in the photograph on the right is Anastasia Manahan aka Anna Anderson. Anna was a patient in a mental hospital in Dalldorf, Germany until another patient said that she recognized her as royalty. Anna would spend the next 57 years of her life claiming to be Anastasia. Neither her supporters nor her detractors would be able to substantiate Anna’s claim during her lifetime. Several years following her death, DNA tests would finally prove that she was not a Romanov.